When I begin advising customers at the onset of their projects, I am often asked, “What is the most effective way to deploy a new system to the broader organization? What are my options?” Although the question seems easy and straightforward, the answer can be very complex. My intent is to provide you with deployment approach options for your organization based on a number of different factors. There are several deployment approaches to consider when implementing a new enterprise wide application: “big bang,” pilot, and a phased approach. Each method has pros and cons–it really comes down to the needs and constraints of your business. No matter how you slice it, the choice to roll out a new piece of software within a company is a huge undertaking that requires time, resources, and an acute knowledge of the effect that the change will have on your operations. Let’s take a look at some of the key points for each type of deployment to help you better understand the approach that is right for your situation. The name says it all–opting for a big bang deployment means defining and developing a solution, testing the build, and applying the changes all at once. This approach means that the entire solution goes live throughout the company with the flip of a switch. Depending on the client situation, this is an option I typically advise customers to avoid. At the same time, I understand sometimes it’s their only option due to factors such as sunsetting systems and license dependencies. Adoption. With this approach, you avoid any overlapping with multiple systems during your adoption. Once it’s time to go live, everyone moves forward with the system at the same time, meaning all people are on the same page in training and knowledge of the new system. However, a mass implementation of this magnitude obviously requires careful planning, with a significant investment in organizational change management and training to ensure everyone is fully trained before the system goes live. Additionally, any flaw in deployment, no matter how small, can cause a rough transition and may invite negative responses from users, leading to decreased user performance and overall acceptance of the system. Technology. In a perfect big bang implementation, a huge plus is the complete cut-over from one system to another in just a day’s time. The quick, clean transfer from one operational system to another will help you avoid maintenance and support of multiple systems at one time. With a big bang approach, you must have a robust and comprehensive testing strategy, because you have to put all of your faith in your bug testing efforts pre-launch. It’s imperative to have users test–and retest–the components of the system to ensure that it is ready. This may result in a significantly longer testing cycle. This deployment strategy requires turning all the lights on at once, and that can make pinpointing defects found after launch difficult. You’ll also find that any bugs identified can be significant and costly to fix, and one error can have implications cross-platform. Financial. One significant benefit of the big bang approach is affordability–scaling implementations can cost a lot of time and money and, as stated above, it can be costly to manage maintenance for two systems. Should all go according to plan, a big bang deployment will see a greater ROI, and you will free up technology and business resources to focus on other projects. However, in the case of a less-than-ideal deployment, you’ll need to make sure your IT resources are at the ready and prepared to deal with a high volume of issues in a short amount of time. These roadblocks, in turn, pose the possibility of disrupting normal business operations, placing a further financial burden on the project. If a big bang deployment strategy is perfectly planned and executed, it can deliver results quickly. However, “big bang” comes with a high level of risk, so I typically advise clients to avoid this option if operationally their business can support other alternatives. I lean toward a safer phased deployment strategy. 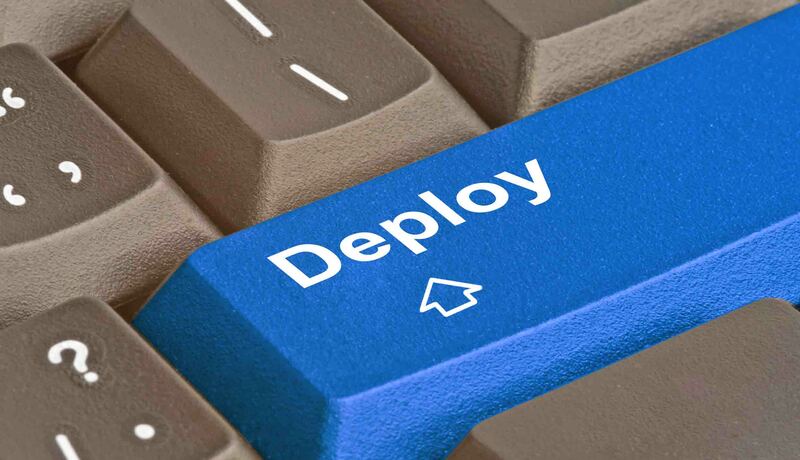 If you want to hedge your bets, a pilot deployment strategy is another option to consider. This option is a close relative to “big bang” but offers a layer of protection with a slightly different approach. Instead of going live all at once, deploy the new application to a small and targeted group of users who can use the system in a controlled environment. Think of this as a dress rehearsal before opening night. Go through the motions, gather user feedback, work out the kinks, make changes and adjustments, and gain some confidence to improve the overall quality of the application. The pilot phase should run for a minimum of 30 days, if not longer, and should include time to ensure feedback is collected and changes to the application are made and tested rigorously. Use any positive feedback from the pilot phase to generate a positive buzz and good word of mouth. Once you have a high level of confidence in the application, you can leverage the “big bang” deployment approach previously outlined above. In contrast with the immediate implementation of the big bang approach, a phased deployment is a more timed and methodical introduction of new processes. Whereas big bang deployment plans everything up front, a phased approach employs a continuous delivery model to ensure a smooth transition over time. Adoption. A phased deployment allows a user to test the waters of a new system. This helps users feel more comfortable during the transition and puts less strain on organizational change efforts. Then, as the company is able to try out the system, users will become excited and embrace the change, leading to higher user adoption. One potential drawback is that end users may have to juggle using several systems and their corresponding processes while the new system is phased in, leading to possible frustration and decreased efficiency. Technology. In a big bang deployment, the business is tasked with cleaning up and migrating data all at once to ensure a one-time roll-out. A phased deployment allows you to do this incrementally as components are slowly added to the system. In this strategy, you will also see less conflict between integrated systems, allowing for better oversight and review of the application deployment. With the longer deployment time, however, you increase the risk of technology from other systems becoming outdated or upgraded before you complete the implementation, which may potentially introduce unforeseen integration issues. Financial. The phased approach is certainly the safer route of the two deployments–the segmented implementation of processes protects the program’s investment and maximizes the chance for long-term success for the organization. A phased deployment is also the more expensive route. The extended period of deployment requires more time and resources to see the project through to full adoption. This means that you could potentially be seeing a delay in your ROI in the short term, but it will minimize your risk of setbacks and missteps. When weighing the pros and cons between big bang and phased deployment approaches, consider what your business needs most and which option will give the most benefit back to the company with the smallest impact on your operations during the transition. If you’re not sure, or if you have additional questions, call us at 833.SIMPLUS to speak with an advisor today.